I saw the following piece of Metroid-inspired window art while traipsing around downtown Seattle with a pack of out-of-town friends two weekends ago and for some dumb reason I forgot until now to share it here. Anyway, I'm guessing someone concocted it (out of Post-It notes, I think) in honor of PAX Prime, which was held in our fair city over the very same weekend? By the way, a number of other windows in the very same building sported similar creations--one of which was inspired by Galaga, I believe, and another that was inspired by The Legend of Zelda--but I was too busy and too lazy to snap a photo of them as well. Sorry about that. To see a few (OK, a lot) more of game-related photos, check out my Flickr photostream. That's pretty cool. I wish I had gotten a picture of it but there used to be Bub and Bob art made from post its in an office building in Dublin that you could see between Tara Street and Pearse Street stations. Hopefully it's still there and I remember to take a photo. 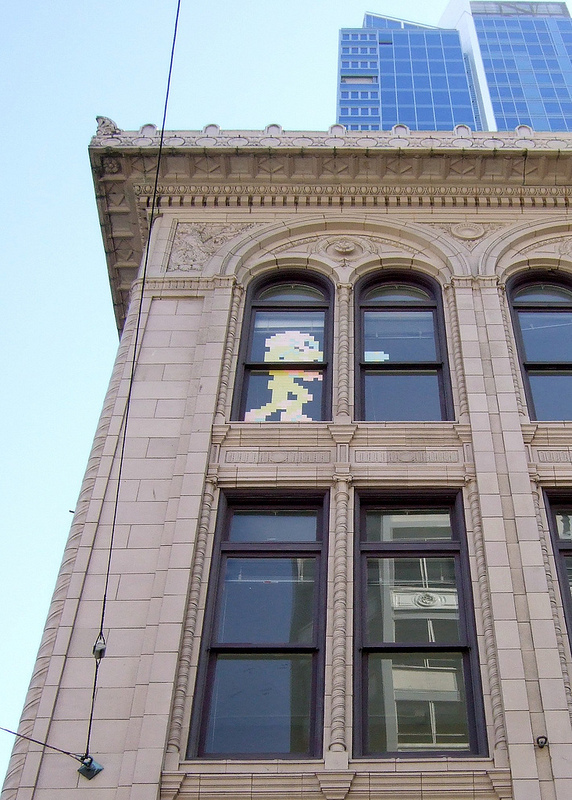 Oh, that sounds even better than this piece of Post-It art, Retr0gamer! Should you actually take a photo of it at some point, let me know, will you? Cute! Samus doesn't get enough love. Especially from Nintendo, right? I mean, they didn't even celebrate the anniversary of the release of her first game :( Sigh. Yeah. Why'd they have to go and do that -- or not do that? Ugh.